I will be spending a lot more time in Minneapolis next year so I figure I’ll have a lot more local material to blog about. Thus, I’ve decided to re-activate this blog with occasional posts about local stuff. This Monday, I took the bus from St. Paul to Minneapolis (haven’t traveled by bus for years but it’s a form of transit I plan on using quite a bit now) for lunch with a friend. 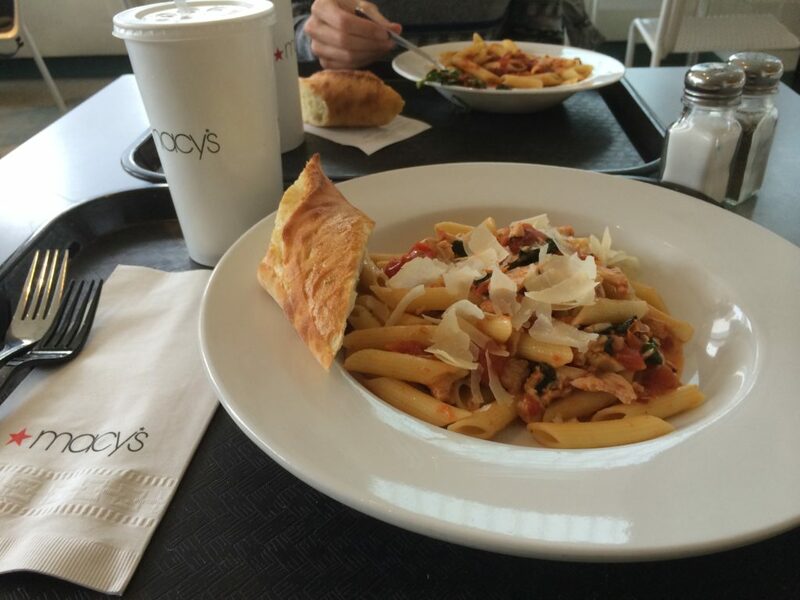 For lunch, we went to to Macy’s Sky Room restaurant (which used to be Dayton’s Sky Room back in the day). I was in a bit of a hurry because I had a meeting immediately following lunch, so I was a bit perturbed that it took forever to get our food. By friend and I both got pasta dishes. After waiting about 15 minutes it dawned on them that they’d forgotten to make her dish but only after they made the wrong entree for me (pictured above). The thing is, I didn’t really know what to order but the photo of an entree they had covering the back wall looked awfully good, so I said “I’ll have that,” pointing to the photo. The dish I eventually got had no chicken, so they had to remake it. And then we had to wait for my friend’s meal to be make. When we finally got our food, we found a table amongst the cafeteria-style seating and ate. The food, was very good; the wait, was awful.